Corinth is called "wealthy" because of its commerce, since it is situated on the Isthmus and is master of two harbors, of which the one leads straight to Asia, and the other to Italy; and it makes easy the exchange of merchandise from both countries that are so far distant from each other. And just as in early times the Strait of Sicily was not easy to navigate, so also the high seas, and particularly the sea beyond Maleae, were not, on account of the contrary winds; and hence the proverb, "But when you double Maleae, forget your home." At any rate, it was a welcome alternative, for the merchants both from Italy and from Asia, to avoid the voyage to Maleae and to land their cargoes here. And also the duties on what by land was exported from the Peloponnesus and what was imported to it fell to those who held the keys. And the temple of Aphrodite was so rich that it owned more than a thousand temple slaves, courtesans, whom both men and women had dedicated to the goddess. And therefore it was also on account of these women that the city was crowded with people and grew rich; for instance, the ship captains freely squandered their money, and hence the proverb, "Not for every man is the voyage to Corinth." Moreover, it is recorded that a certain courtesan said to the woman who reproached her with the charge that she did not like to work or touch wool: "Yet, such as I am, in this short time I have taken down three pieces." 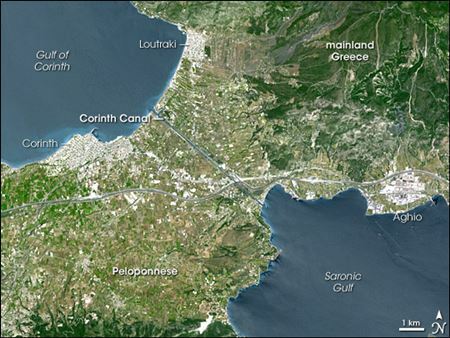 Another important aspect to Corinth culture was the Isthmus Games which it began to host around 580 B.C. This huge international athletic festival, second only to the Olympics and dedicated to the Greek god Poseidon, took place every two years. In 146 B.C., when Corinth was torched, laid to waste and its inhabitants killed or sold as slaves, worship at the temple of Aphrodite ceased but the Isthmus Games continued hosted by a nearby city. In 44 B.C., Julius Caesar colonized the desolated Corinth as "Colonia Laus Iulia Corinthiensis," rebuilt it as a Roman city and by 27 B.C., became the capital of the Roman province of Achaia. As its wealth grew, Corinth was once again the host of the Isthmus Games, where victors of each event won a wreath of celery stalks. The games and the victor’s wreath are likely what Paul was referring to in 1 Corinthians 9:24-27. By the time the apostle Paul arrives, Corinth had the largest population in Greece with Greeks, Jews and Romans. While the majority of Corinth was Greek, the Latin names mentioned in Paul’s letter attest to its Roman influence. For example Jews had Roman names: Aquila (1 Cor 16:19) and Crispus (1 Cor 1:14). Gaius (1 Cor 1:14) and Fortunatus (1 Cor 16:17) appear to be Roman. Only Achaicus (1 Cor 16:17) is a Greek name. As an important point of commerce, Corinth was also inhabited by Phoenicians and Phrygians from the east. The cult of Isis, originally from Egypt, was prevalent in the Roman empire and placed an emphasis on "wisdom". The Greek historian Plutarch describes Isis as "a goddess exceptionally wise and a lover of wisdom, to whom, as her name at least seems to indicate, knowledge and understanding are in the highest degree appropriate... ."
The cult of Mithras, of unknown origins, began sometime during the first century. Significant to Corinth is its emphasis on "mysteries." The 10th century Byzantine Encyclopedia known as the Suda indicates of Mithras, "no one was permitted to be initiated into them (the mysteries of Mithras), until he should show himself holy and steadfast by undergoing several graduated tests." Thus the religious background to Corinth extended well beyond Judaism, Christianity and Aphrodite which Paul possibly alludes to in 1 Corinthians 8:5. Some scholars speculate that Corinth was influenced by pre-Gnostic thought; however, there is no evidence of such a belief system developed during Paul’s time. Instead it is likely that components that would lead to the development of the Gnostic belief system in the second century existed during this syncreatic religious environment. From his letters to the Corinthians, Paul writes to a church comprised largely of Gentile and Greek members. As new members of Christ, they bring with them their pagan and cultural influences such as glorifying wisdom and ecstatic utterances, eating meat offered to idols, promiscuity and the denial of bodily resurrection. Roman / Greek society permitted prostitution, and the legal process of taking disputes to the city magistrate was customary. Paul’s approach to the problems of Corinth is by grounding and centering his arguments on Jesus Christ. He opens his letter addressing to the divisions within the church by appealing to the unity of being baptized in the name of Jesus Christ (1 Cor 1:11-17). Jesus Christ is the wisdom of God (1 Cor 1:20-24), and He is the foundation of the church (1 Cor 3:11). Immorality within the church is akin to yeast that permeates dough (1 Cor 5:6-13). Paul confronts this issue by reminding the Corinthians the purpose of Jesus Christ’s sacrifice as the paschal lamb and its implications to the Believer and church. The imagery of the Feast of the Unleavened Bread (1 Cor 5:8) and the Exodus provides a tangible meaning to salvation and sanctification; get rid of the sins among you that you have left behind in your old life! Paul rebukes immorality at the personal level. To continue with a sexually immoral life is to join Jesus Christ to a prostitute (1 Cor 6:15-20)! Consuming food offered to idols is associated with idolatry. Paul asserts the sanctity of the Lord’s Supper, its symbolism with the body of Jesus Christ and implications when that sanctity is not recognized (1 Cor 10:13-22). The dispute about the resurrection is confronted with the fact of the resurrection of Jesus Christ (1 Cor 15:3-19). Against the cultural background of Corinth, Paul exhorts the church to "Be imitators of me, just as I am of Christ" (1 Cor 11:1). "The Devil only tempts those souls that wish to abandon sin and those that are in the state of grace. The others belong to him; he has no need to tempt them." 1. Keener CS, The IVP Bible Background Commentary, New Testament, Downers Grove: InterVarsity Press (1993). 2. Schaff P, History of the Christian Church, vol. ii, Grand Rapids: Wm. B. Eerdmans Publishing Co. (1910). 3. Terry RB, A Unifying Theme of 1 Corinthians, doctoral dissertation: A Discourse Analysis of First Corinthians, Arlington: University of Texas, 1993. From the website: AN ANALYSIS OF CERTAIN FEATURES OF DISCOURSE IN THE NEW TESTAMENT BOOK OF I CORINTHIANS. 4. Youngblood RF, ed., Nelson’s New Illustrated Bible Dictionary, Nashville: Thomas Nelson Publishers, (1995).